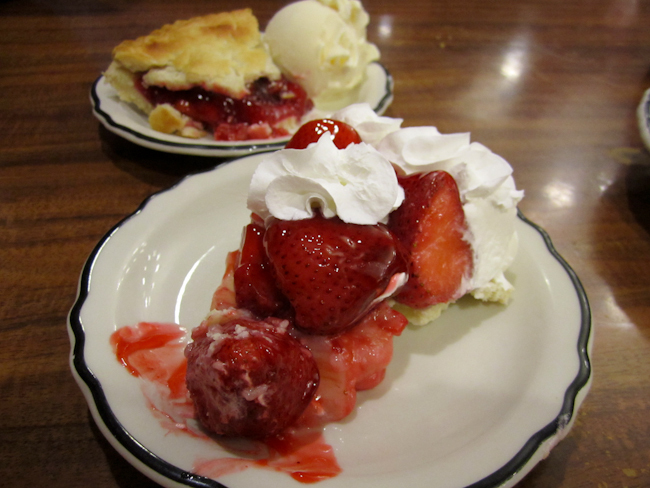 Today I was overcome with a sudden craving for strawberry pie so I asked hubby to take me to Anna Miller’s. Last time I went there was maybe in college, but I was so happy with my meal today I vowed to go back more often. Once in a while, a nice old-fashioned American meal really hits the spot. I always assumed Anna Miller’s was a huge US chain since it’s so famous in Japan, but it turns out it started in Hawaii and expanded only to Japan (source: Wikipedia). Their menu features 24 hour breakfast, burgers, spaghetti and diner favorites like club sandwiches and chili. And of course, every kind of pie for dessert! 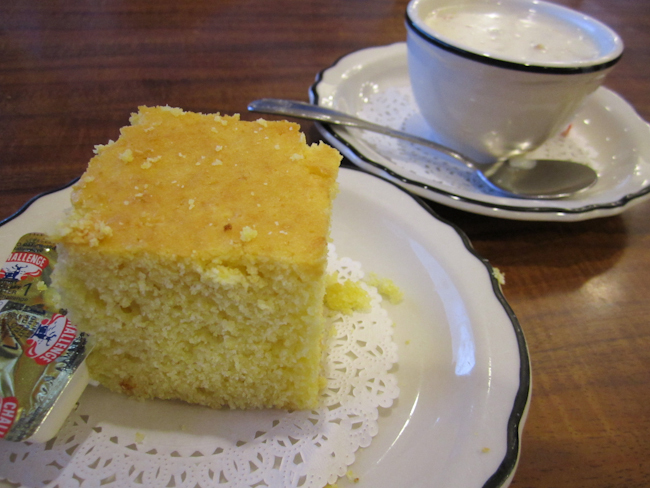 Hubby’s entrée came with warm cornbread and choice of salad or soup (corn chowder here). 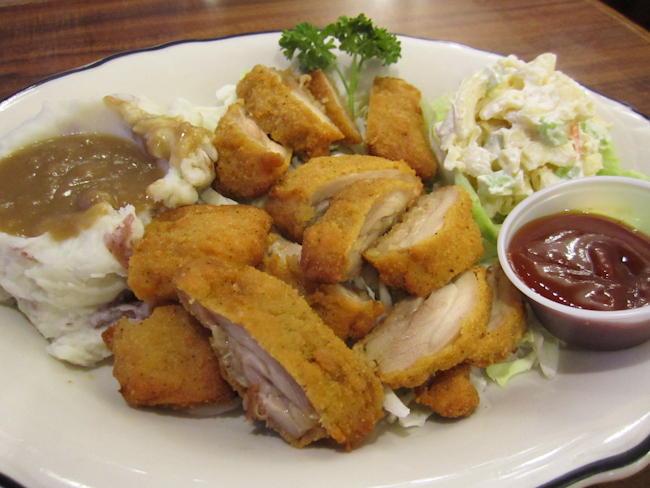 His Chicken Katsu ($12.99) with choice of sides mashed potatoes and mac salad. You could also choose from rice, fries, vegetables, cole slaw, potato salad. 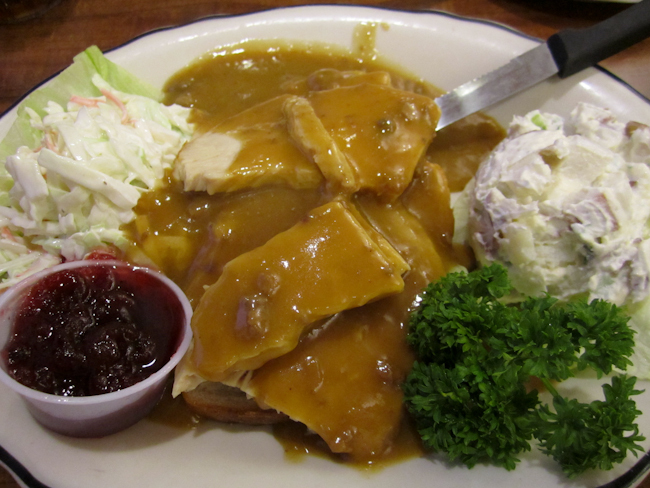 My Hot Turkey Sandwich ($9.99) smothered in gravy with my choice of potato salad and coleslaw on the side. I remember growing up in Connecticut, hot turkey sandwich was my absolute favorite school lunch menu. One slice of white bread, slice of deli turkey breast, scoop of mashed potato, gravy on top. I had never seen anything constructed with bread like this until then, and to me it was an eye-opening, genius combination of all things good. I still get excited thinking about it. You rarely find this dish in restaurants these days, so I was so happy with my dinner tonight. And of course, pie for dessert! 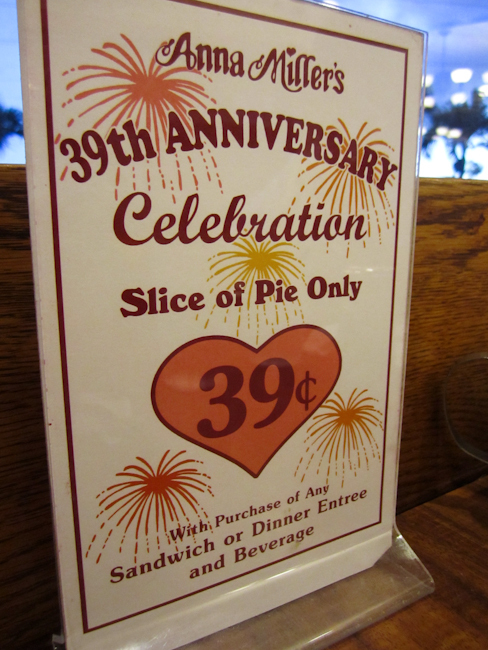 Hubby’s cherry pie ($0.39 + $1.99 for à la mode) and my fresh strawberry pie ($0.39). Large whole glazed fresh strawberries on top of a shortbread like crust, with just a bit of pastry cream, and a generous squeeze of whipped topping. Ooooh yeah. Love their strawberry pie! It’s also fascinating to hear about Anna Miller’s in Japan. I read the Wikipedia entry you cited and followed it to some other articles. So interesting! Interesting, right? I was sad to also read that it seems there’s only 1 location left now in Japan. It was like all the rage in the 1990s when I was in high school in Japan, all my guy friends would want to go to check out the cute girls in the maid uniforms! I love it! So the strawberry pie is only seasonal? Bummer. I will have to make sure they have the strawberry pie before heading out again.